THIS IS A SPECIAL ORDER ITEM AT 20% OFF MSRP. 53451 LokProgrammer unit, power supply, serial PC cable, manual, software CD, USB adapter (Dimensions: 95mm x 85mm x 22mm (3.74 inch x 3.35 inch x 0.87 inch) You want to listen to the sound spectrum of your favourite loco, or the special sound of that loco around the corner in the yard – on your model railroad? No problem with ESU’s LokProgrammer! One prerequisite: A PC with sound card and Windows. Simply record the original sound of your engine and edit it at home with your computer. Many customers did this already successfully. Even if you don’t yet belong to this elite group of LokSound Pro’s, the LokProgrammer is still a very useful tool for you. It is the easiest way to program your ESU-decoder. You need no programming experience, thanks to the graphic screen everything falls into place with a few mouse clicks. What the LokProgrammer can do: •Change the sound safed on the decoder. •Setting of all digital parameters of the Loksound decoder such as address of the loco, operation speed, maximum speed, braking deceleration, brightness of bulbs etc; you can set all options with your computer very easily - no cumbersome entering of CVs (configuration variables) with your command station. •Rearrange your sounds and transfer it to the LokSound decoder. •You can use all sounds that can be downloaded to your computer hard disk. •Sound can be allocated to different events. •Additional sounds can be activated via function buttons. Sound With the LokProgrammer you can erase the sound data of any LokSound decoder as many times as you wish, and replace it with a different sound. To this end we offer on our homepage more than 200 different, fully matching sounds of various prototypes and locos for downloading on your computer. Also you can edit just parts of a sound project: You don’t like the decoder’swhistle? Just replace it with one of the many others. Suitable sources beside those offered by us, are in Windows *.wav format available. Sound – even voice or music is no problem for our decoders. With the LokProgrammer’s aid you use the entire flexibility and functionality offered by LokSound decoders. Programming By the same token, all other ESU decoders profit from the LokProgrammer’s versatility; no matter if DCC, Multiprotocol - or mfx decoder. With its help it’s possible to edit all parameters of the particular decoder simply and conveniently. The available options depend on the kind of decoder. Beside addresses and acceleration - and deceleration settings, this concerns above all the allotment of function keys (function mapping), the allocation of special effects to the individual outputs, or the lamp brightness. The LokProgrammer can also help when optimizing back EMF parameters or the loadable speed table. All options can be programmed very conveniently: There is no tedious punching-in of CV-numbers at the digital station anymore. Hook up It’s this simple: The LokProgrammer is a small programming box, which is wired between the PC and a programming track. To connect it you need either a vacant serial interface, or you use the included USBadapter cable (works with Windows 2000 or Windows XP). For power we include a 500 mA wall power supply. If your needs are greater (e.g. 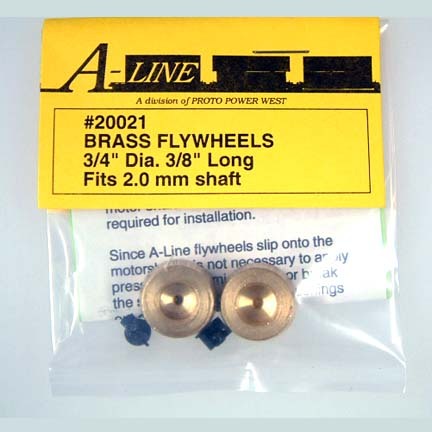 for gauge I engines), you can also use a conventional model railroad transformer. Software After hook-up you start up the especially user-friendly LokProgrammer software, which is included on CDROM. This runs on all modern Windows-systems from Windows 98. 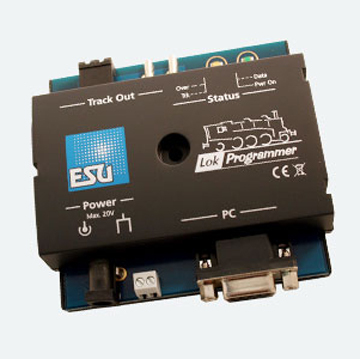 Just put the loco with the ESU decoder on your programming track, and right away you can read, edit or program it. The Programmer automatically recognizes the decoder in the engine. Simplicity The LokProgrammer is recommended not only for the use with our ESU decoders: By now, many well known model railroad manufacturers factory-furnish their locos with ESU-decoders, which of course can be modified again within the frame work of their technical specifications – with the help of the LokProgrammer. You see, purchasing a LokProgrammer pays off in any case. Upgrades The LokProgrammer can also be instrumental in updating decoders. Almost all ESU decoders are updatable, in case you desire a new software version. To do this, you only need the LokProgrammer and a small update-program, which you can download from our homepage.